Background: pyrazolo[3',4':4,5]pyrimido[1,6-b][1,2,4]-triazines have been found to possess a wide range of medical activities. 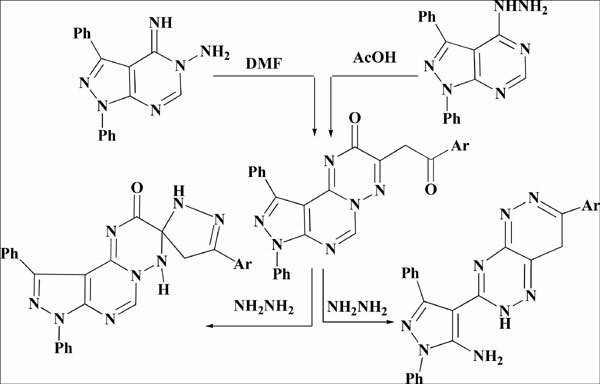 Objective: we interested to synthesis a new series of pyrazolo[3',4':4,5]pyrimido[1,6-b][1,2,4]triazines via the reaction of 1,3-diphenyl-4-hydrazino-pyrazolo[3,4-d]pyrimidine with ethyl aroyl pyrovates and invistigate thier antimicrobial activity. Not only the biological activity is our aim but also, to elucidate the actual tautomeric structure of the products. Method: A new series of pyrazolo[3',4':4,5]pyrimido[1,6-b][1,2,4]triazine derivatives was prepared via condensation of ethyl aroylpyruvates with 1,3-diphenyl-4-hydrazino-pyrazolo[3,4-d]pyrimidine. Also, treatment of these compounds with hydrazine hydrate afforded a new series of 1,3-diphenyl-4-(7-aryl-2,6-dihydropyridazino[ 3,4-e][1,2,4]triazin-3-yl)-1H-pyrazol-5-amine. Results: The mechanism of the reaction was discussed and proved to proceed via Dimroth rearrangement. The structure of all the newly synthesized compounds was established on the basis of spectral data and elemental analysis. The antimicrobial activity of the products was screened and some derivatives showed promising activities against the used bacteria and fungi species. Conclusion: We success in synthesis of a new series of bioactive pyrazolo[3',4':4,5]pyrimido[1,6-b][1,2,4]triazines and elucidation of their actual structure. Keywords: Ethyl aroylpyruvates, Dimroth rearrangement, pyrazolo[3', 4':4, 5]-pyrimido[1, 6-b][1, 2, 4]triazine, antimicrobial activity, 4- hydrazinopyrazolo[3, 4-d]pyrimidine. Keywords:Ethyl aroylpyruvates, Dimroth rearrangement, pyrazolo[3', 4':4, 5]-pyrimido[1, 6-b][1, 2, 4]triazine, antimicrobial activity, 4- hydrazinopyrazolo[3, 4-d]pyrimidine. Abstract:Background: pyrazolo[3',4':4,5]pyrimido[1,6-b][1,2,4]-triazines have been found to possess a wide range of medical activities.